Soleanna New City is an Adventure Field in Sonic the Hedgehog (2006). One of three overworld area in the game, this area is an important hub for Action Stage access, Town Missions, and hidden medals. The commercial and industrial center of Soleanna, the New City is decidedly more modern-looking than its counterpart Castle Town. Tall buildings and wide roads have taken over from rustic boutiques and cobbled footpaths; there's even a modern port area with warehouses and ship-loading cranes, and the headquarters of the Rimlight Corporation can be found here. There are a couple of GUN agents quietly operating here, as Shadow the Hedgehog can discover. 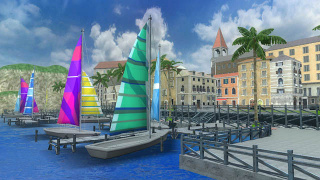 The New City isn't all business, however, as it also hosts Soleanna's marina, where colourful yachts crowd the jetties. In Silver's time after the Day of Disaster, it appears that the New City turns into the decidedly less pleasant Crisis City. This Adventure Field provides access to the Radical Train stage, as well as Soleanna Forest in the west.